World leaders gathered to remember the 41st President of the United States, George H.W., Bush at a state funeral in Washington. But there was a moment of awkwardness when current leader Donald Trump walked into the National Cathedral with First lady Melania Trump. Bill Clinton was chatting away with Barack and Michelle Obama. While Hillary Clinton had been talking to the 39th US President Jimmy Carter. That was until the Trumps came along. Melania politely shook the hands of Barack and Michelle Obama and Bill Clinton. She also waved over to Hilary Clinton. 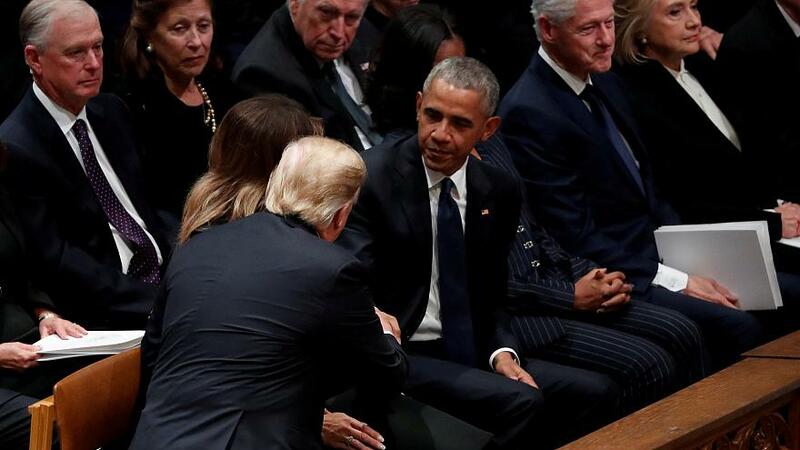 Donald Trump, however, plonked down onto his seat before he shook hands with his predecessor Barack Obama and Michelle. However, Trump looked away without greeting the Clintons. Hillary was Trump’s rival in the 2016 election.